I have been watching a lot of sports lately. There was the Women’s Soccer World Cup and now the Tour de France. Sport gives spectators the opportunity to witness the agony of defeat and to study the many ways people choose to respond to failure. Maybe you think of failure as a mistake like Laura Bassett’s own goal. 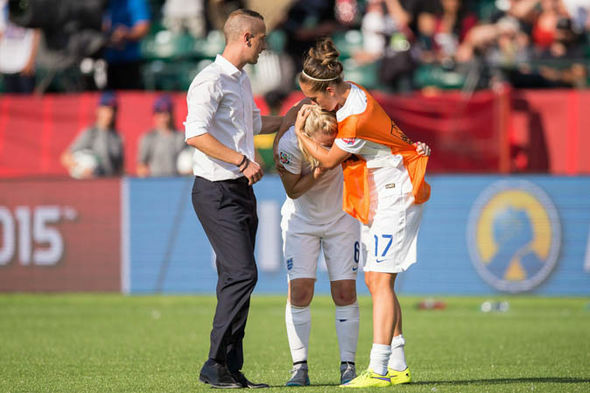 Bassett had been playing terrific football in the World Cup when she did something that unfortunately could define her career. Her own-goal in stoppage time ceded the win to Japan. “I couldn’t breathe, my heart was out my chest and I wanted the ground to open up and swallow me,” she said afterward. For example, Tony Martin missed the yellow jersey (first place for general classification in Tour de France) in the first stage time trial by just 5 seconds. He closed the gap to one second and continued to pursue the yellow in the next 2 stages. Finally he saw his opportunity and fulfilled one of his dreams by breaking away in the last 3 km and won the stage and the yellow jersey. He took the honor of wearing yellow seriously, so when he crashed within 1 km of an uphill finish on Stage 6 he struggled to get on his bike and finish the race. Failure may be a gift. First, what we think we want may not be what is best for us. The phrase “be careful what you wish for” often sums this up. Often a failure gives us the space to reconsider what we really want and to reevaluate our goals. Second, we learn so much more from our failures than from our successes. Generally when we succeed we spend little time examining what went well, or what went wrong. Nothing like failure to help us be more introspective. The critical thing about failure is how you choose to look at the event and what you choose to do next. The key is to consciously choose. Alas, it is tempting and easy to default to a perspective of victimhood or to beat ourselves up because we fell short of our goal or made mistakes. We have a choice of perspective. Tony Martin receives support from Etixx-Quick-Step teammates. What did Tony Martin do after his crash? He let his team help him across the line. He had an open fracture of collarbone (piercing the skin) yet he struggled through the duties of drug testing, awards ceremonies and interviews, all the time looking like he was going to vomit from the pain. He exhausted every possibility to return to the race the next day and then when he knew he had to go to Germany for surgery that night, he stopped to say farewell to his teammates and thank them for their support. His choices after his biggest disappointment of his career has solidified his reputation as a classy guy and a leader. I do not know how Laura Bassett is handling her public failure after all the World Cup hoopla. I believe she started for England against Germany and won the bronze medal. Not everyone is able to recover in the moment as Tony Martin did. Nor should we expect them to, so when I say it is important to choose what you do next, I actually mean next and next and next. Then one day you move to a place where you no longer play it over and over in your head and you are no longer identified with the failure. I have had some big failures and disappointments in my life. My most recent is selling everything I own, quitting my job and putting all of my resources toward moving to New Zealand. I was only able to stay 5.5 months and had to move back to Sacramento. I was devastated and to some degree I am still trying to figure out why and what next. Externally I am better off financially and I am closer to my family, so most people probably think I have recovered. Emotionally I am still processing the failure and I feel more stuck than I look. I am still in the dance trying to figure it out.